As our program year came to a close last month, we asked our leaders to reflect on what we had accomplished together. Over the past six months, as we witnessed hatred and bigotry erupting across our country, we responded by rising up together with our allies to create a tidal wave of resistance. From a place of deep despair and outrage, we have gathered to sing and organize our way into our own vision of a besere velt, a better world. 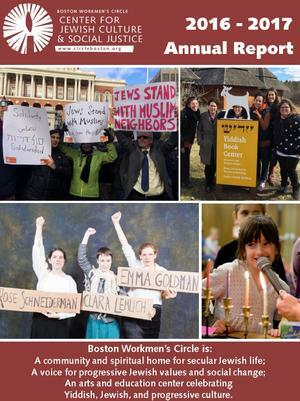 In this Annual Report, you will read about all the ways our community has come together to respond to injustice, to celebrate our culture, and to rise up together. As a grassroots member-led organization, our people are our greatest strength. This year our people have been busy! Together we put on 175 programs attended by thousands of people ages 0-96. These programs were organized by over 100 BWC member volunteers. This year we saw unprecedented growth in the number of new leaders who stepped up to get involved and take on leadership, including one of our Shule alumni who created the Immigrant Justice & Sanctuary Working Group. and making donations throughout the year. amplifying our impact and our collective power. community that we all envision. This year we hope to grow that community to 500 members. Thank you for contributing your voice to this community. Click here to download and read this year's 2016-2017 Annual Report. Click here to download and read last year's 2015-2016 Annual Report.